Few outdoor activities are more widely enjoyed than hiking. According to Statista, a statistics portal that gathers studies and statistics from more than 18,000 sources, more than 37 million people in the United States went hiking in 2015. That marks an increase of nearly eight million from 2006. Hiking is a great activity that makes for great exercise and a wonderful way for people of all ages to spend time enjoying the great outdoors. Veteran hiking enthusiasts recognize that hiking, while a fun activity, can quickly become dangerous if they don't exercise caution and prepare for their hikes. Novice hikers may want to focus on a handful of areas before going on their first hikes. Appropriate attire and footwear can make hikes safer and more enjoyable. 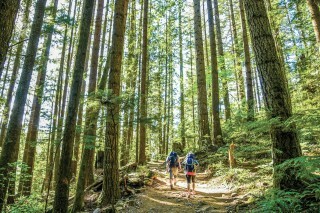 The American Hiking Society notes that hikers going on short hikes that do not involve heavy packs or technical terrain can wear trail shoes, while hikers should wear hiking books when carrying heavy loads or traversing more technical terrain. Boots offer more support than hiking shoes, making them more suitable than hiking shoes on difficult terrain. In addition to wearing footwear appropriate to the terrain they will be traversing, hikers must pack rain gear and extra clothing. The AHS recommends that hikers dress in layers so they can adjust to changes in the weather and their activity levels. Avoid cotton, which keeps moisture close to the skin, and bring a hat to protect against unforeseen rainstorms and insects. GPS services on such devices when they need directions. But it's important that hikers recognize networks may not be accessible in wooded or remote areas. As a result, hikers should not think they can rely exclusively on technology to help them when they get lost. Hikers should carry a map and compass during the hike, making sure they bring an updated map of the trails they will be hiking. Extra food and drink can help hikers whose hikes end up taking longer than they anticipated. Choosing snacks such as protein bars that can fill a person up without making him or her feel sluggish is a good idea. In addition, hikers should pack enough water to keep them hydrated during the hike and longer in cases a person gets lost or wants to stop and enjoy a nice view along the way. The AHS notes that drinking too little water during a hike can make one susceptible to hypothermia and/or altitude sickness. Hikers should purchase a prepackaged first-aid kit for hikers, which the AHS notes can be found at any outfitter. In addition, a knife or multipurpose tool can help a person perform repairs on broken or malfunctioning gear. If need be, hikers should bring a backup pair of eyeglasses or, if contact lenses are worn, a lens kit and eyeglasses just in case. Hiking is an enjoyable activity that continues to attract millions of people. But hikers must take steps to ensure their hiking trips are safe.